this is disgusting we are struggling enough to pay our council tax and other things rent etc. etc. wonder what the House of Lords would think we MUST let them know some how…. finally dscudder needs a lorry load of tissues for his sweaty head and every time he opens his mouth who needs beetroot do you know what I mean!!!! you just have to look at him – fancy him making you a cuppa you won’t need water cause his sweat will be enough to fill the kettle up. The highest council tax in the county with the most privatised services where is our money going? Since I have lived in Watford … I have never seen any thing other than Lib Dem propaganda through my letterbox ( probably in that time they have demolished a large forest). There is little evidence of any other candidates. Perhaps Ms Thornhill should spend a little more time reading the Highway code and understanding which side of the road she should drive on .. I witnessed her driving at speed and turning into a road without stopping on the wrong side of the road an accident was only avoided as the other car stopped in time or she would have hit it straight on! For those who don’t know that is Watford’s FibDem Mayor and a member of House of Lords!!! Dotty seems to manage being the Mayor and her ‘work’ at the Lords somehow. GW: Well FibDem Mayor D Thornhill set that precedent didn’t step down from a paid Mayor position but said she intended to hold down HofL & Mayor and get paid for both. So maybe the voters just thought ”not again”. At the end of their last term of mismanagement Labour were borrowing £3 billion a week just to keep their policies active. Even if they had been returned to power in 2010 this could not have continued and they would have been forced by our creditors to put in place many of the austerities they now castigate the Tories for. When it comes to voting there is only one question for people to ask themselves before they decide how to choose and it is as follows. If since 2000 the L-r Party had been continuously in power do they think they would be substantially better or worse off now? If the answer to that question is ‘No’ then there is surely no reason to tempt fate and give them power over us again. There could be a question number two. Do people believe that the Farronites manic opposition to Brexit is founded on a belief that Brits will be better off by staying in the EU or is it more to do with the unelected power that small parties enjoy by association with their similar in the EU? The economy was just starting to recover in 2010 . Because we had hit the biggest financial crisis in history. In 2008 Debt to GDP was 45%, historically this is a low-level of debt. Stop lying about the situation. What’s the debt mountain now after 7 years of Tory mis-rule? Oh yeah, greater than at any other time in history and worse still, greater than all previous administrations combined moving ever closer to £2 trillion. Where has that money gone ‘friend’. But no international banking crisis to explain such a position, yet this our reality. 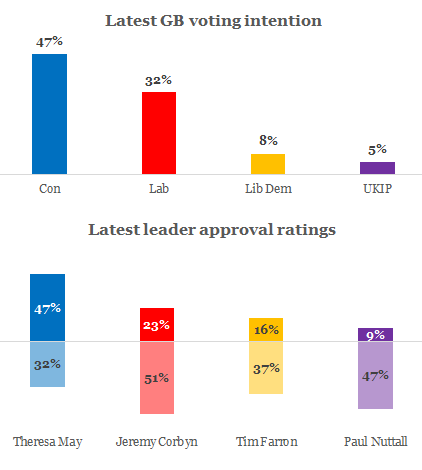 May is personally popular but she is not impregnable, her greatest weakness is her cabinet, its clear she trusts no one except Fallon and Ruth Davidson, Labour need to exploit that and target weak links like Hammond, BoJo the Clown and especially the Cunning Hunt. It’s time for McDonnell to play bad cop methinks; weaponise the cyber attack, blame the Health Secretary personally (politics was never meant to be fair) its his fault that the NHS is using computers that are older than some of our nurses, nurses how are having to use food banks! Shameful. I also think that JC should do as many leaders debates and TV appearances as he possibly can, whether May is there or not, people need to see the man and not the caricature that the Tory press portrays. Social media also has a role to play, the first priority should be to get young people registered to vote before the deadline. May 2018 Mayoral Election – so long as we don’t get this?